Carrying a handgun is without a doubt the most common weapons crime in the state. 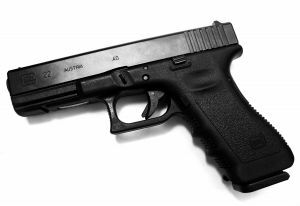 The state gun laws are extremely strict compared to other states, and although the legislature may soon be forced to modify these gun laws it is still difficult to obtain a gun carry permit. These laws can affect nearly anyone, and police officers make hundreds of arrests for gun crimes each year. We have seen out of state residents from places such as Virginia that are arrested and jailed for carrying a gun in a manner that is completely legal in their home state. Maryland has some of the strictest gun laws in the country, so do not get caught off guard! The Herbst Firm is available anytime to offer a free consultation about these strict laws, and the best ways to defend a criminal charge. Many times these violations are charged as part of an arrest for a separate crime, such as a drug distribution or drug possession. Officers who frequently make drug arrests may locate unlicensed or illegal handguns upon search and seizure of the drugs, and can tack on a weapons crime violation as an additional charge. Police also may locate weapons after making an arrest of citizen involved in an altercation. Assault and battery charges, and domestic violence cases are often accompanied by a weapons crime charge. But arrests also frequently occur when a citizen is not committing any other sort of criminal violation. Police may locate handguns and other firearms upon conducting traffic stops or upon initiating a citizen contact of a pedestrian. The Constitution gives police officers a reasonable amount latitude when conducting a stop and frisk pat down search for weapons, and cops often extend the latitude granted to them by the Constitution. Because firearms present a danger to police officers, and their size makes them readily noticeable, police may be able to conduct a legal pat down on any citizen they encounter for so called officer safety purposes. Sometimes officers ask permission to initiate these pat down searches, but even if permission is not granted an officer will often still conduct a search. Many times an arrest for carrying may be the result of an illegal search, and a criminal lawyer may be able to suppress this arrest under state law. The State law that prohibits carrying a handgun is described in section 4-203 of the Maryland weapons crimes statute. This section includes wearing a handgun, carrying a handgun, and transporting a handgun. The handgun carry laws here are highly detailed, and do not prohibit all types of handgun possession or transportation. For example, it is not illegal to carry a handgun within the confines of your home or apartment regardless of whether the gun is registered, or the owner has a permit. An owner may also carry a handgun between his or her home and a repair shop, or his or her place of business if the gun owner is also the substantial owner of the business. In order to legally transport a handgun for these purposes, a gun owner must carry the gun in a case or holster, and the gun must be unloaded. The penalties for violations depends on whether the defendant has a prior conviction, and there may be minimum mandatory jail sentences involved. With no prior convictions there is a minimum 30 day jail sentence upon conviction. A second time offender may face a 90 day minimum mandatory jail sentence. If you have been arrested or charged with a weapons crime in anywhere in the state contact the handgun lawyers at The Herbst Firm.